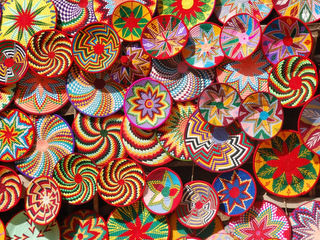 For those intrepid travelers looking for something a little different, Ethiopia has much to offer. As the only country in Africa never colonized, much of what you encounter is uniquely Ethiopian. Strong influences from ancient kingdoms abound, along with Christianity as evidenced in the many old churches found throughout the north. A land of lush mountain landscapes, Ethiopia has many endemic species, as most of the country is contained within the Rift Valley. Paired with the modern, bursting capital of Addis Ababa, travelers to Ethiopia will find a fascinating history and cultural heritage, dating back to the emergence of the first homo sapiens! We believe that to travel responsibly, a portion of our tour cost should benefit the communities we visit. For this trip, our donation will go to a non-profit organization we support that is having a very positive impact in Ethiopia: PATH—who works on diverse health issues ranging from HIV/AIDS to child malnutrition to malaria, applying innovative new strategies and proven solutions to improve the health and well-being of Ethiopians. 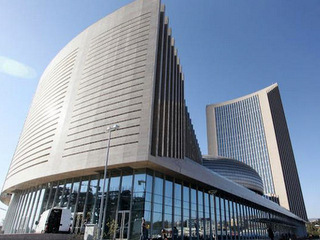 Depart home and fly to Addis Ababa, capital of Ethiopia and headquarters for the African Union as well as home base for the United Nations in Africa. Upon arrival at the airport, you will be greeted by your guide, who will assist you with your hotel transfer. Lose a day due to travel and time change. Sample the rich history of Ethiopia with a morning visit to the National Museum, where a replica of Lucy—the oldest hominid discovered to date—is on display. In the afternoon, drive out to Mount Entoto for your first taste of rural Ethiopia. Immerse yourself in Ethiopia’s imperial past with stops at Raguel church, filled with sacred paintings and Kidist Mariam, where Menelik II was crowned Emperor in 1889. 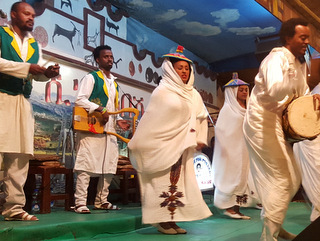 Enjoy a delicious Ethiopian meal and a live performance of traditional music and dance this evening. After your short flight to the northern city of Gondar, drive to Buhit Ras in Simien National Park, taking in the stunning scenery and village life along the way. 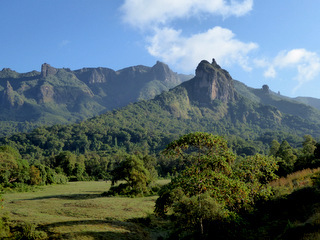 The southern part of the park is often called the Roof of Africa, due to the large number of high peaks in the range. Arrive at your mountain lodge in the afternoon, and if time permits, take a short hike in one of the most scenic areas in Ethiopia. 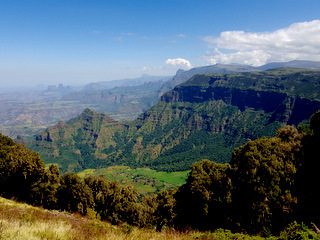 Several species endemic to Ethiopia are found within the park boundaries, including the gelada baboon, the endangered Ethiopian wolf and the Walia ibex. 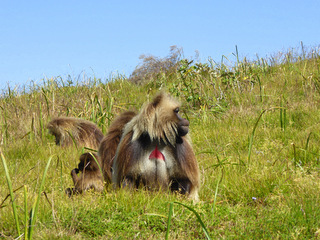 Spend the morning and early afternoon trekking to Sanqaber, where you’ll likely encounter a band of Gelada Baboon. Approach quietly and find yourself in the midst of these gentle animals. A delight for all the senses, watch the baboons dig for roots as swallows and various raptors swoop and soar overhead in the fragrant, thyme-filled grasslands. After a day of hiking enjoy a refreshment at the highest bar in Africa! After an early breakfast, drive back to Gondar. Founded in the 17th century by Emperor Fasilides—this city was the royal capital of Ethiopia until the mid-19th century. 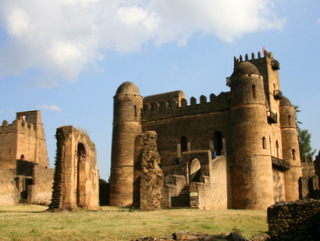 Emperor Fasilides and his descendants built several beautiful castles in a compound you’ll visit this afternoon before taking in the gorgeous religious paintings in the Debre Berhan Selassie Church. Morning flight to Lalibela, designated a World Heritage Site in 1978 due to its beautiful 12th-century, rock-hewn churches. This afternoon, visit one group of these churches, wrapping up the day with a visit to the most majestic and best preserved—Bete Giyorgis. This evening dine on fusion Ethiopian food and marvel at the gorgeous views from your mountain-top restaurant. This morning hike to Asheton Maryam with a visit to a local village enroute where you can try your hand at making traditional injera, the pancake-like staple food made from the grain teff. 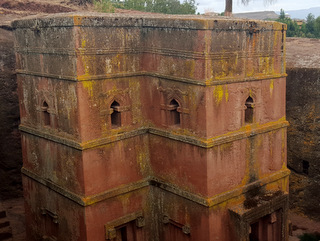 This afternoon, take in the remaining rock churches in Lalibela, all unique and exquisite. Return to Addis Ababa after breakfast. 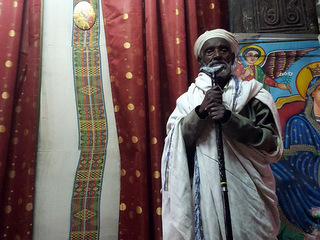 Optional tours for the afternoon include visiting the Ethnographic Museum—housed in one of Emperor Haile Selassie’s palaces and filled with treasures that represent Ethiopia’s rich culture, a half-day culinary tour sampling the many delights of Ethiopian food, or some last minute shopping in the Piazza district. 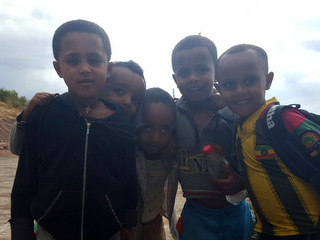 Say goodbye to the warm and welcoming people of Ethiopia. A private car transfer is provided to the airport for your departure flight home. Extend your stay in Ethiopia with a visit to Bale Mountain National Park, an exceptional destination for wildlife and culture. Ask for details.